Bastian Seelbach slipped into game audio in 2007 after his audio engineering education at the SAE Cologne, getting the chance to build up the first in-house audio department at EA Phenomic working on large scale real time strategy games. He was working as game audio freelancer for about three years on various game projects of different scopes and styles before taking over the next in-house challenge to build up the audio department of Hamburg-based multi-project studio Bigpoint in 2012. In 2016 he joined Guerrilla Games in Amsterdam in the hot phase of the development of Horizon Zero Dawn. Since then he shipped Horizon Zero Dawn and Horizon Zero Dawn’s - The Frozen Wilds expansion. Horizon Zero Dawn is critically acclaimed for its sound, dialogue and music score. However, at its inception, this open world project presented a paradigm shift for Guerrilla Games, noted for the rather more linear Killzone series. 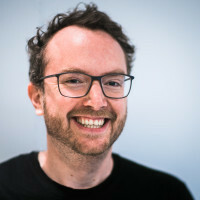 Using some key examples from the production, Audio Lead Bastian Seelbach will recount a story of dramatic changes in complexity and scale, explaining the audio team’s problem-solving approaches to tackling and overcoming challenges that open game environments introduce, while trying to find the voice of this brand new world called Horizon Zero Dawn.